Dry cleaners everywhere rejoice. Tomorrow we pack away the white trousers and jackets, the spectator shoes and white bucks, the seersucker and madras. Unless, of course, you are visiting or living in the tropics. On the subject of linen, I am more flexible. If it’s hot enough to want to wear a breathable fabric, please do. I just stay away from white, unless it is a dress shirt. You are such a gentleman Chris! Lucky Mrs E! This is probably your best photo! Classic/stylish/chic! Have a grand day off. I like the look a lot, though I personally save black for after 6 pm. 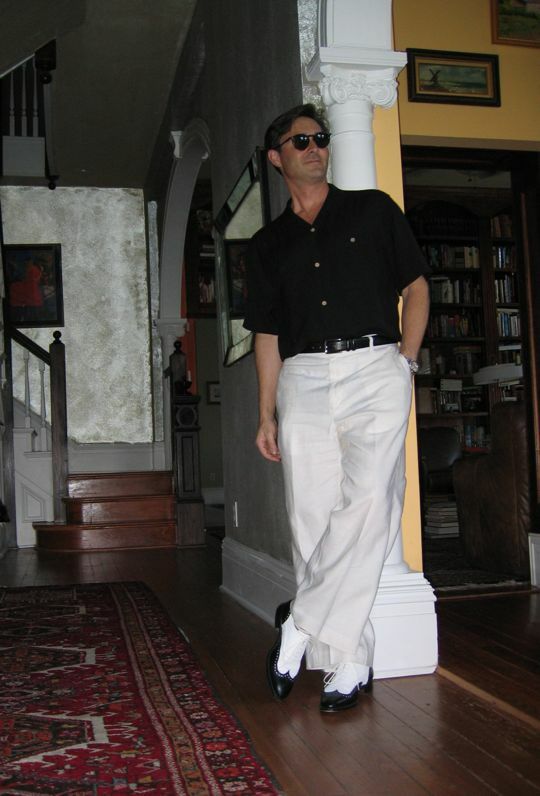 Actually, I can’t wear black close to my face, so I don’t, but I have worn a similar outfit with a French blue shirt. I put away my white ducks, white cotton cardigan, and summer ties today (sniff). On the other hand, I just got a “new” (i.e., thrifted) tweed jacket that I can’t wait to have altered so I can wear it! Where I live, the weather is cooperating by cooling down, so it’ perfect timing. Can I blow up that photo into a poster to hang inside my closet door? No, wait…on the outside of my closet door! That combination would look great on women, too. I love spectators! Anon 11:12, choose a thinner belt and perhaps a Hollywood waist trouser and that result would be very chic for a woman. Just have to wait ’til next summer. Thank you Karena. I’m trying. And I’m the lucky one, believe me. Thanks Paul. That’s the trick isn’t it? Wearing the classics without looking too anachronistic. Tricky. Glad you approve. Suburban Princess, Thanks. They were an indulgence this year. Brooks Brothers. It’s got to do with the reverse calf upper. Brent, we’re in that midseason slump. Too warm, too cool, too rainy. Three to four season wools are the best bet.